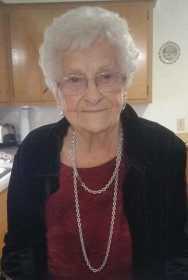 Valorie Darlene Worsley, 96, passed away on Thursday, March 14, 2019, at the Via Christie Hospital in Pittsburg, Kan., following a brief illness. Valorie was born June 8, 1922, in Mindenmines, Mo., to John C. and Jessie Wolfington Coleman. On Oct. 25, 1941, she was married to Gene Worsley and he preceded her in death on Dec. 13, 1979. Valorie grew up in the Mindenmines and Foxtown areas and attended the Cockrell School there. She was a homemaker most of her life. Following Gene’s passing, she worked at the Nevada State Hospital in Nevada until her retirement. Valorie was an avid gardener. Survivors include four children, Neil Worsley and his wife, Kay, Arma, Kan., John Worlsey and his wife, Mary, Fort Scott, Kan., Nila Halcomb, Nevada, and Boyd Worsley and his wife, Christy, Bronaugh, Mo. ; nine grandchildren; 15 great-grandchildren; four great-great-grandchildren; numerous nieces and nephews; and daughter-in-law, Peggy Worsley, Lamar, Mo. She was preceded in death by her husband, Gene; her parents; one son, David Worlsey; three brothers, Harold Coleman, Jim Coleman, and Bud Coleman; and three sisters, Lela Bair, Bonnie Hill, and Estylene Stewart. Funeral services will be held at 11 a.m., Wednesday, March 20, at the Liberal Christian Church, Liberal, Mo. Interment will follow in Worsley Cemetery, Bronaugh, Mo. The family will receive friends 10 to 11 a.m., prior to the service at the church. Contributions may be made in Valorie’s memory to the Worsley Cemetery or Liberal Christian Church in care of Ferry Funeral Home.